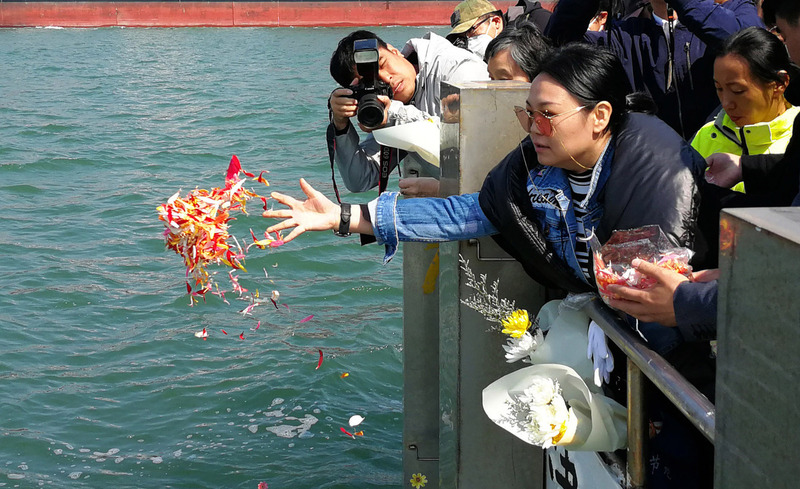 The general procedure for sea burials in Shanghai is simple: After a traditional funeral service onboard a ship, family members of the deceased are taken to the designated waters, where they scatter the cremation ashes of their loved one, along with flower petals. After that, they bow to the sea to bid farewell. According to a report by the Shanghai Funeral Service Center, the ashes of 44,652 deceased residents in the city have been scattered through this dignified, simple service since the city started sea burials in 1991. The desire to consign cremated ashes to the deep is growing among Shanghai residents whose last wish is no longer to have their ashes stored in columbaria, or sepulchral vaults. Wang Yan, a manager from Feisi, the only operator of the city's sea burial services, said that there were 4,132 people buried at sea in 2018. She expected the number to rise to 4,500 this year. In 1991, there were fewer than 300. Wang said the service is provided twice a day, seven days a week, with one ship capable of carrying more than 300 people. Since 2007, the city has designated a public memorial day for sea burials. It usually takes place in March, ahead of the Qingming Festival, or Tomb Sweeping Day, which falls on April 4 or 5. For thousands of years, Chinese have held on to the tradition that the dead should be buried in coffins in the ground beside their ancestors. It has sacred meanings, with deep attachment to the homeland. With the increasing population in modern times, however, the custom has put a strain on the country's land resources. China has banned the burial of bodies in its most populous areas in recent years. The only exceptions are for 10 ethnic minorities. Most urban residents select cremation after death, with the ashes interred in tombs in cemeteries. According to the China Funeral Service Development Report by the Ministry of Civil Affairs, about 8 million people died annually in China in 2013, and the existing tombs in most provinces were expected to be used up within 10 years. In Shanghai, the total land available for cemeteries was around 8 million square meters in 2013, according to the Shanghai Civil Affairs Bureau, a fraction of the 30 million sq m available just a few years before. The cost of purchasing a cemetery plot has surged in recent years, with some plots in Shanghai reportedly selling for 300,000 yuan. Ecological burial methods, including sea burial, tree burial, and flower pot burial, have since emerged as alternatives. Sea burials are particularly attractive. "Sea burial is cheaper compared with storing ashes in a columbarium, and requires no follow-up maintenance, an advantage over the other ecological burials," said Zhong Fulan, chair of Shanghai Folk Culture Society at East China Normal University. "My mother instructed me to release her ashes into the sea after she died, hoping to save land for the country," a woman surnamed Shen from Shanghai told the local news portal ThePaper.cn. Her mother died in 2003. Shen has attended the city's annual public memorial day for 15 consecutive years. "Influenced by my mother's choice, I'll also choose an ecological burial when the day comes," she said. A woman surnamed Liao said her deceased father chose sea burial because of his deep attachment to the ocean. "My old man was born in Shanghai and loved the river and sea, but he lived his whole life inland, far away in Shaanxi province," Liao said. She brought her father's cremated remains to Shanghai for a sea funeral five years ago. "After all, it was his last wish to come back home," she said. The same sentiment was shared by the husband of a 72-year-old woman surnamed Huang from Shanghai. "Our daughter emigrated to Germany years ago. Before my husband died two years ago, he opted to be buried at sea so that his ashes will go across the ocean to where our daughter lives and she can worship him anytime, anywhere," said Huang, adding that she will do the same for herself. As a growing number of people choose sea burial, Wang, the burial operator, said services have been improving. "The government is supportive. We already have the ship tailored for the service and have established a mature workflow," she said. The weather is an ongoing challenge: Only April, May and October are suitable for sea burials in Shanghai. Safety demands the avoidance of heavy weather, such as thunderstorms. Those three months, however, provide enough time to meet the current demands of Shanghai residents, Wang said. "We will serve better and create new related projects to promote this ecological burial method to residents," she said.